My Princess Bible is based on the popular format of My Pajama Bible. The new board book combines princess-like art of women of the Bible with art more reflective of the modern-day princesses who will learn of biblical women. My Princess Bible shares stories of 19 women of the Bible through a rhyming story and a short takeaway summary in prose. Each story ends with two lines that remind the reader of valuable character traits of a princess; the little princesses are even encouraged to recite the learning of the biblical princess using her name in the blank instead: “________ is God’s special princess; ________ is sad when she does something bad” (the takeaway from the story of Eve). This format helps children see biblical women as princesses who teach us about godly principles. It also helps reinforce that the little girl reader is special and seen as a princess because she is created by God. The final story (number 20) is taken from Psalm 139 and features the reader as the godly princess. It reminds the reader that princesses are daughters of the King and are loved by God. 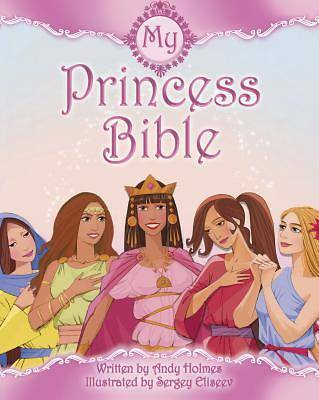 Little girls will love to read My Princess Bible over and over to learn about God’s princesses.